This tutorial will review the process of restoring a full SuiteCRM backup. If something goes wrong with your website and you have a backup that you wish to restore, you can easily follow the steps in this tutorial to achieve that. The first step is to restore the files of your SuiteCRM backup. You will have to consider the location, where you wish to restore your website and ensure that it is empty. If you are restoring the backup on the primary domain of your account, you will have to upload the SuiteCRM files in the public_html/ directory of your account. The second step is to restore the backup of your SuiteCRM database. For this purpose, you will have to create a new and clean database and a user assigned to it with full privileges. Once you get your new database, you can proceed with the actual restore of your backup. First, access your cPanel account and locate the Databases section. Click on the phpMyAdmin service. From the list of available databases on your account, select the one you have just created. Click on the Import button on the main menu. Select the dump backup file of your database from your local computer and click on the Go button to import it. Up until this moment, you will have a location on your account that contains all of the files of your SuiteCRM backup. You will also have a database that contains the backup of your SuiteCRM data. To complete the restore, you will have to edit the SuiteCRMconfiguration file. When editing the file, you will have to edit the database details first. Simply enter your new database name, username and the password it is using for the restored database. 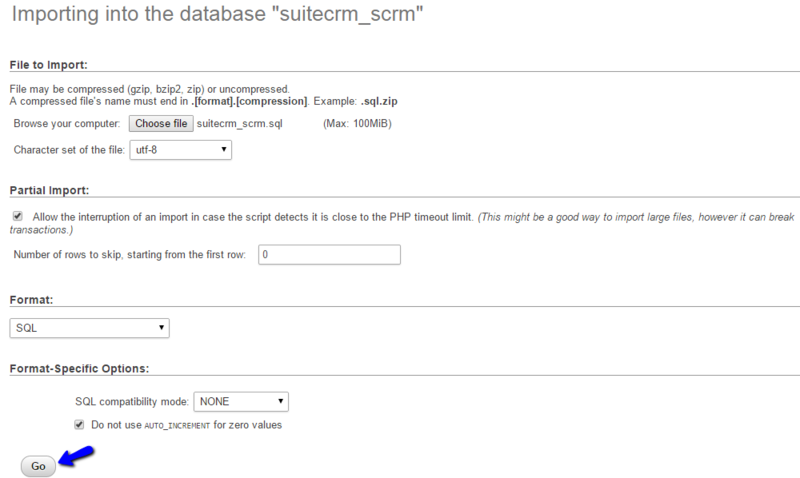 You can also edit the URL for your SuiteCRM installation, if you are restoring the backup on a different location. When you complete that and save the changes, you will be able to access the restored copy of your SuiteCRM backup without any issues.